By & large that was the reaction with most people who were involved with our local pantomime after we had finished on Saturday. There is something healing & therapeutic about being involved with a group of people of disparate gifts and abilities all working towards a common goal. Out of that- eventually- comes idle chatter, banter and sharing of lives: community. Of course there is bitchiness, misunderstanding and falling out- ‘community’ encompasses those things as well. I will miss it, but my first reaction on Sunday morning was to mentally work out where else ‘community’ would be happening in my week: I need community to be ‘me’. Fortunately I made it to church & then I am leading Beaver Scouts tonight (and meeting with leaders later tonight and tomorrow). And then comes Friday, where I hope to be spending some hours with friends at The Bay Horse. I think we all need community: latterly advertisers have cottoned on to it: if I see another advert full of hip 20 somethings living in urban loft apartments, festooned with luxury goods & driving eye wateringly expensive cars, I may well write a passive aggressive blog post about it. The (un)subtle message is ‘Buy our products and you can have a life like this…..until we release a newer version that is’. Sometimes human relationships/friendship groups can be constructed around this- you can be part of us/close to us, but only if you can consume like we do. Whilst I am still attracted to the advertisers vision: it is so seductive….. In my better days I know which version of community that I want to be part of and which is more satisfying. The last 2 performances of the village pantomime for 2016 are today. I am in Act 1 in the chorus and the latter stages of Act2 as an over the top, double entendre spouting ugly sister. (1) Those who can sing and dance at the same time have some kind of black magic. I can do the former: the latter escapes me however hard I try. (2) I know enough now with acting, that those who do it professionally are incredibly gifted. I am not. I just like being loud and random. The sillier the costume, the more I can get away with it. 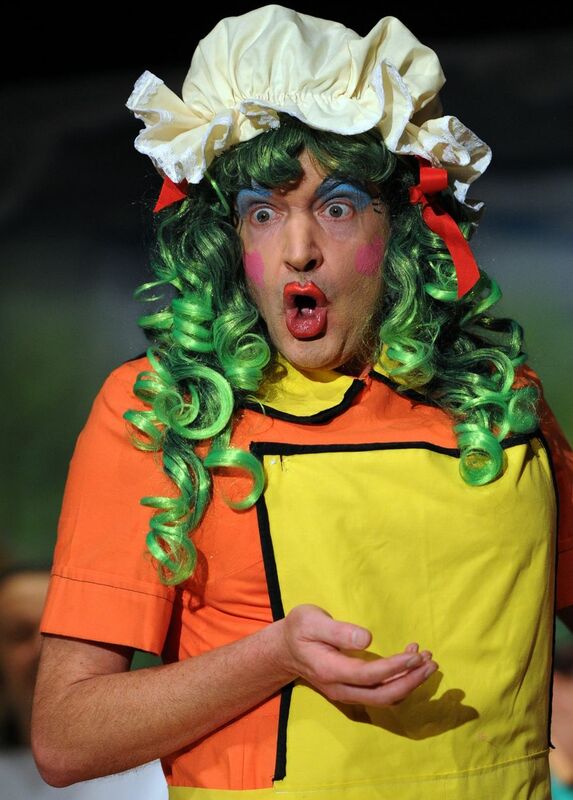 (3) The people who do the most work in putting on a village panto are rarely seen on stage. (4) The shared ritual of pantomime beings people together. It does not work without an audience who are ‘up for it’. (5) It is the nearest thing to Mardi Gras that the repressed English have: it is the only time that men can pretend to be women, women men and for people to randomly (and with no continuity) break into song. (6) No matter what the pantomime, the plot is the same. (7) It is fun: lots of fun. I miss it when it is gone. I always thought that this pantomime would be my last: if I had stayed in the Methodist system, I would have been moving this July/August. Now I have left, I could well be here for much, much longer: excuse me whilst I write the dates for the September auditions in my diary…. I have met leaders who only really seem to talk to other leaders. Having a real kind of relationship (apart from ‘me parent, you child’) with someone below them is too threatening. Anyone outside that leadership circle is subordinate: at worst they rebel, ‘do not see the visiion’, ‘need help’ or are just obstructive; unable to see things as clearly as the leader. Ok: maybe an exaggeration, but it highlights the need to realise that it is not just you who contributes to the ‘success’ of anything (I cringe inwardly, and sometime outwardly when a vicar/priest/pastor/says ‘I turned this church around). Each time I do panto I am reminded of this. At first I was so nervous, I just concentrated on getting the lines right (never managed that yet) and being less wooden than the scenery. Then, as I realised more of what was going on and how some things just seemed to ‘turn up’, I came to see that what happens on the stage is a minor part of the whole procedings. That is not an exaggeration: it would be nothing with props, costumes, lighting, directions, scenery. But there are also the large number of people who know the tradition, have been around for years and watching you do hesitatingly do roles that they did years ago. The Good Book does talk about never getting puffed up with pride and how true leaders are servants. Sometimes it needs a panto to wake you up to that. Author GrahamPosted on January 22, 2015 Categories PantomimeLeave a comment on Break a leg! You learn a script. You keep learning a script as your brain gets addled. Then you go onto a stage and the director tells you where to move to and how to alter what you are doing. You go through this several times. Sometimes you just focus on one scene until you get it right. Then you add costumes and costume changes until you think it is ready. It all changes when ther is an audience. Sometimes they laugh in unexpected places. Sometimes they don’t laugh at all. Sometimes saying the same line in the same tone but moving differently gets a reaction. Sometimes altering intonation works. You have to learn the art of ‘faithful improvisation’- too far off script and it becomes indulgent and something it is not. Too slavish and it becomes drained of life and sterile. This faithful improvisation is uncertain and a tricky combination of cast, audience, knowing the plot well and what happens in the moment. When it works, even at my amateur level, it is thrilling and full of life. But attempting it carries risks: it could go wrong or fall flat. And with a continuity gear change that is almost unbelieveable, I have met preachers, churches, panto casts, you name it that are incapable of faithful improvistaion. Author GrahamPosted on January 21, 2015 Categories PantomimeLeave a comment on Oh no it’s not! 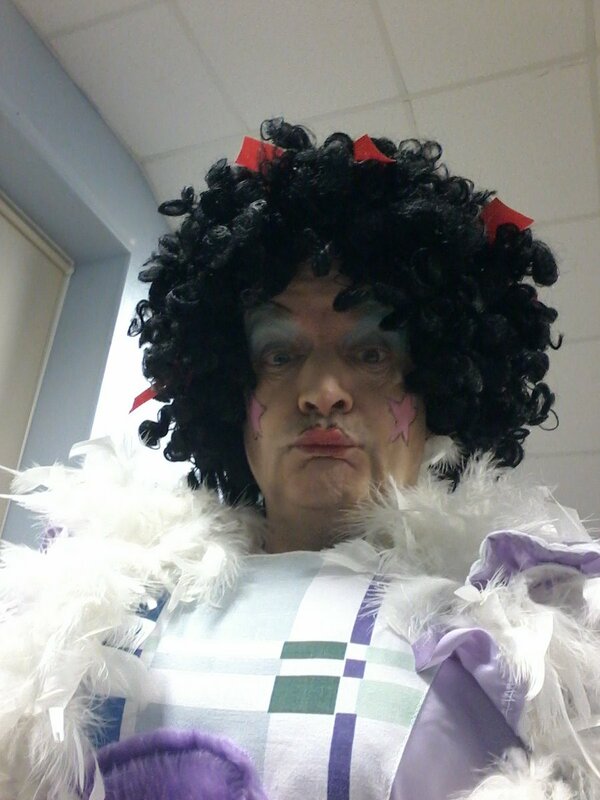 I have just finished my involvement in the village pantomime for this year. I had a smaller role than before but I enjoyed it so much. I had a psychological need to be a ‘baddy’: indeed that was my aim when I first auditioned 5 pantomimes ago. It struck me how much pantomime is part of a living ritual. It is not quite drama and not quite comedy, although it includes elements of both. It is more like shared ritual and works best when cast and audience realise that. If the cast step back, it does not work: it needs people to go beyond normal standards of acting and sometimes ham it up. The more unbelievable, the more it works. If the audience come and sit there and expect to be entertained without participating, it falls flat. Panto scripts follow the same narrative arc, they are full of plot holes, unbelievable situations, double entendres etc. To work, the audience have to be engaged and participate. If they don’t- it falls flat: there has to be a symbiotic realtionship between those at the front and those watching. …which I guess is a bit like church: turn up and expect a show and …well it all becomes a bit crap really. Author GrahamPosted on January 20, 2015 Categories PantomimeLeave a comment on He’s behind you! I haven’t put anything on this year about the village pantomime. Not that it isn’t good: for a village pantomime I think it is excellent: high quality production values, stunning scenery, great singing and dancing & all By amateurs. It has been partly as other things have crowded my head: debating over whether to change jobs, getting a new one and the difficult process of trying to find a home (still unresolved). Maybe also as my role is a small one ; although given these last few months, I am grateful for that- I valued the space. I play the world’s most camp robber cheif. True; I manage a gruffish cockney accent, but it is pantomime- that is the way of the genre. Don’t fight it…. NB: After this afternoon, it is on Thurs and Fri evenings, Sat aft & evening next week- tickets still avaialable! 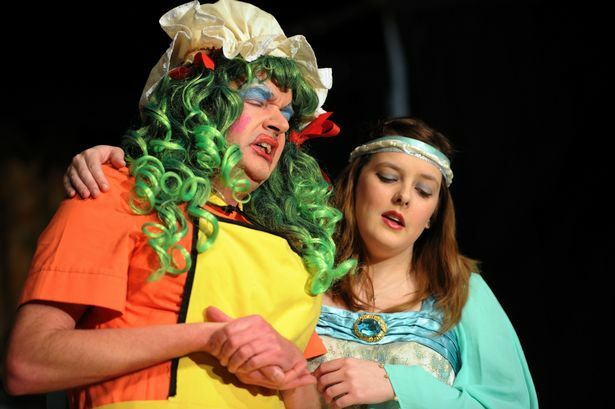 Today is last day of 7 performances of the annual Hutton Rudby Pantomime (2 are today). For a village of around 2500 to support 7 performances and have well over 900 people coming to see them is quite something. I could do a thoughtful blog on how as a minister in a small community you would be daft not to get involved in such a major cultural event in where you live, move and have your being. Alternatively, I could take another tack: how the performers on stage are nothing without the legions who help dress, design staging, direct, make tea, do make up, have the vision etc and apply to how Christian community works best…. …..today I will concentrate on being camp, wringing the last shred of innuendo out of the numerous double entendres and wildly overacting.